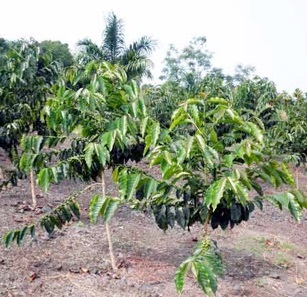 Kona coffee is grown in the North and South Kona Districts of the Big Island. Hawaii, the Big Island, is so big that all the other islands of Hawaii could fit into it. At 4,028 square miles (10,432 square kilometers), it is the largest island in the United States. Originally built from five shield volcanoes – Kohala (extinct), Mauna Kea (dormant), Hualalai (active but not currently erupting), Mauna Loa (active), and Kilauea (active and erupting more or less continuously since 1983), the Big Island boasts some of the newest land on earth and the southernmost point in the United States. Hawaii was brought to the attention of the western world by Captain James Cook, explorer, navigator, and cartographer of the 18th Century. In fact, Captain Cook died at Kealakekua Bay in 1779. The backbone of the economy for over 100 years was sugar cane. Over the 20th Century, sugar cane plantations waned, and the last plantation closed in 1996. 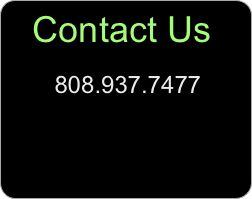 The two main population centers are Hilo, the county seat, located on the east side of the island, and the Kona area, on the west side of the island. The resident population of the island in 2010 was 185,079, and the island now is known for tourism, orchids, one of the largest cattle ranches in the country, and a number of crops like coffee, cacao, tea, macadamia nuts, and several varieties of tropical and temperate fruits and vegetables. 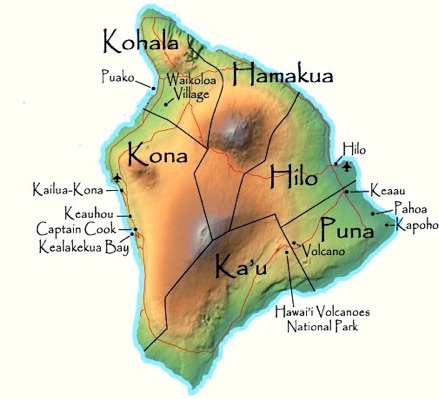 The Big Island is divided into a number of districts, and North and South Kona are what is generally called "Kona." It is in these districts that Kona coffee is grown. 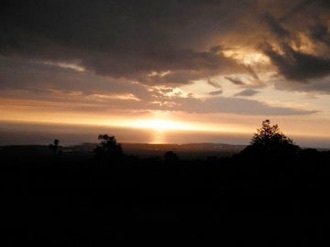 Our farm is about five miles north of the village of Holualoa in the North Kona District. Holualoa had a 2007 population of 7,093. It is known for art galleries and studios, and also hosts a bed and breakfast inn, a post office, a small grocery store, a gourmet restaurant, a florist, an elementary school, and a church or two. Holualoa is also home to hundreds of small coffee farms. 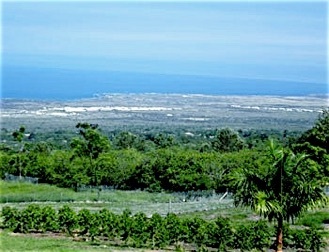 At one time, Kona was the only coffee-growing region in the USA. Even now, Hawaii is the only coffee-growing state in the USA.